The performance of gas without the noise, mess and fumes; mows up to 2 miles on a single charge. The EGO 56V Li-Ion Mower delivers long-lasting power, rapid charging and durability in all-weather conditions. The advanced EGO power+ 56V battery uses industry-leading Arc-Lithium technology to deliver Power Beyond Belief and is compatible with all EGO power+ products. 5 year limited warranty on EGO outdoor power equipment and 3 year limited warranty on EGO Power+ System battery packs and chargers. Please contact EGO Customer Service Toll-Free at 1-855-EGO-5656 any time you have questions or warranty claims. The Poulan Pro PR450N20S gas-powered push lawn mower is the perfect choice for mowing small to medium-sized lawns. Lightweight and easy to use, this 20-inch mower features a side discharge cutting deck and is well suited for yards with flat terrain. The compact design means it manoeuvres easily around trees, rocks and flowerbeds to make it a perfect trim mower. The easy starting Briggs & Stratton 450e Series 125cc engine provides 4.5 ft. lbs. gross torque to supply all the power you need along with a fast, reliable starting system to get you mowing quickly. The quick adjust, 5 position lever lets you customize your grass height from .1-inch to 3.5-inch. Unlike similar competitor units, this lightweight mower is fully assembled and ready to use right out of the box. Equipped with a high performance Briggs & Stratton. 140 cc 550E Series engine and 21-inch steel cutting deck, the Poulan Pro PR550N21R3 push lawn mower is a lightweight and efficient workhorse. This 3-in-1 mower is capable of side discharging, mulching, and rear bagging. It has five quick-adjust cutting height positions, and is ideal for small or medium-sized yards that are mostly flat. For the homeowner who's not interested in handling or storing fuel, dealing with exhaust, or fumbling with cumbersome power cords, the all-new hassle-free Poulan Pro PRLM21i battery-powered lawn mower is the ultimate solution. Powered by a 58V lithium-ion rechargeable battery, it features instant push-button starting and provides the power and performance typical of gas-powered push mowers, without all the noise and harmful exhaust. The 21-inch steel cutting deck is capable of side-discharging, mulching, and bagging. It has five cutting height positions, and over-sized 11-inch high rear wheels for easy manoeuvring. With a built-in battery power meter, it's easy to monitor power usage, and the handle-mounted, easy-to-view battery power indicator guarantees you'll never run out of power mid-task. This quiet, lightweight, ergonomically designed, and environmentally friendly mower is powerful, easy to start, easy to operate, and perfect for small yards and homes with close neighbours. Ideal for the smaller yard, the compact, 161cc push gas-powered Power Smart DB8621P push lawn mower is easy to operate in tight spaces and features 3 cutting systems including side discharge option, mulching capability, plus a collection rear bag. The deep dome deck design accompanied with the sharp and solid blade makes for better mulching. Easy to operate and weighing just 68 lbs., the mower also features a durable steel deck that cuts a 21 inch. swath and adjustable height from 1.18 to 3 inch. to meet your varying needs. 20-inch 56V Li-Ion Cordless Battery Push Mower (Tool Only) The performance of gas without the noise, mess and fumes; mows up to 2 miles on a single charge. 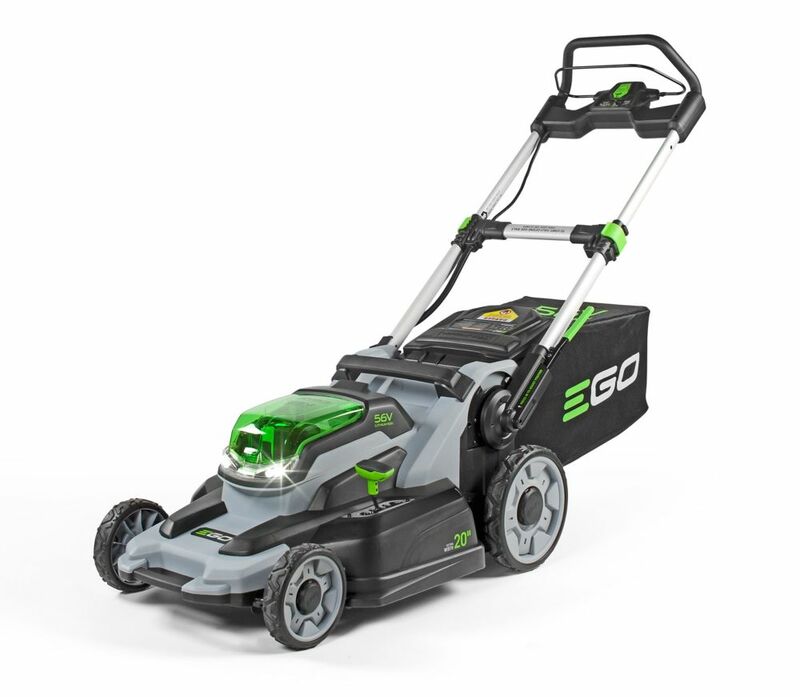 The EGO 56V Li-Ion Mower delivers long-lasting power, rapid charging and durability in all-weather conditions. The advanced EGO power+ 56V battery uses industry-leading Arc-Lithium technology to deliver Power Beyond Belief and is compatible with all EGO power+ products. 20-inch 56V Li-Ion Cordless Battery Push Mower (Tool Only) is rated 4.5 out of 5 by 762. Rated 5 out of 5 by The JD from Cut it early Works like a champ. Can use early in the morning and won't wake the neighbors. Rated 5 out of 5 by Charlie M from Pricey but pleased Having started my corded-to-cordless transition previously with an EGO blower and trimmers, this mower was the last piece of the yard care puzzle... one that I kept putting off due to the price. A spring sale finally got me to pull the trigger, and now wondering why I waited so long! Simple to set-up and use. Lightweight. So far so good through a couple of weekly mows through thick, wet grass. Also like the way the handle easily folds down for storage. But by far not having to deal with setting up and constantly account for the whereabouts of a cord is what has me the happiest with my purchase. Rated 2 out of 5 by Sant from Mower good. Battery Bad The mower does its job. A 5 AH battery is almost enough to cover my medium sized yard. However one battery died within 1 year and the other within 2 years. Although they were replaced by Ego under warranty, it is a rate of failure I am not comfortable with. Rated 5 out of 5 by WillT from The mower works perfectly for our fairly small yard, and... The mower works perfectly for our fairly small yard, and the battery powers several mowings before needing recharge. Instructions were clear and easy to follow. Best part: quiet for a power mower and non-polluting. Rated 5 out of 5 by Jack46 from Beats gas powered lawnmowers. I bought my EGO battery-driven lawnmower after getting fed up with gas. It has accomplished everything I expected it to do. I was so impressed I bought my two daughters their own. I did have a problem with the one I bought which I brought to the attention of EGO. By phone, after discussing the problem, I was told I would be sent a replacement which arrived within a couple of weeks. Totally awesome, great service and they back their guarantee. A customer for life. Rated 5 out of 5 by JD from Easy as pie. Great tool. Love all my... Easy as pie. Great tool. Love all my EGO tools. Rated 5 out of 5 by Jeremy from Amazing I've had mine for 3 years. It's strong, quiet, stores nicely. Can't say enough about it, it's great. Is that true that this mower doesn't come with a battery? That would be ridiculous! When I buy a car I expect the wheels to be included. Hello Steppara! While the model you are referencing does not come with a battery or charger, we do not have models available online that includes everything to run the tool! Try looking at LM2002! Some customers may have other EGO product already, and do not want to have additional batteries and chargers, so we make the option available to them here! Thank you for your question. Answered by: EGO Support Team. Hi Danielle! No, this is a bare tool, meaning that it does not come with a battery or charger. Thank you for your question! Hello Digger! While the battery will certainly power the mower, your run time will be very short. We recommend using 4.0Ah batteries or above and keeping the smaller Ah batteries as backup. Thank you for your question! Tough to say, as run time is hugely impacted by terrain, but stronger batteries provide longer cut time. If you have a hilly or large lawn, we&rsquo;d suggest using one of our more powerful batteries or alternatively, making sure your second battery is fully charged and ready to go. With the 2.0Ah battery, you can expect up to 20 minutes of run time. Does this lawn mower come with the battery? Or is it sold separately? I'm wondering what the differences between the EGO lawn mowers are? Seems there is 20' and a 21' and the prices are quite different. Does the cheap one $397 come with all that is required? Battery etc? The particular model that you are looking at does not include a battery or charger. It&rsquo;s also crucial to remember that battery selection will have a significant impact on run time (the higher the Ah, the longer the run time). Furthermore, the 20&rdquo; and 21&rdquo; models will have different cut capacities and weights. Does this Lawn Mower come with a battery? This model does not come with a battery. However, we do have kits available that include a battery and charger. Simply search LM2002-P for the latest price and availability.